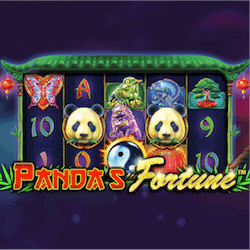 Panda’s Fortune does not do much new and at times it seems like a mismatch of elements jammed together in one pokie but something about this Pragmatic Play title just works. It is fun to play, the features are entertaining to unlock and before you know it you find yourself smiling and having a good time. Pragmatic Play has recently signed some incredible content deals with major providers and when you play a title like Panda’s Fortune you realise why they are one of the most well know names out there. Panda’s Fortune sports some really neon colours and some beautiful looking reel icons that span the range of the usual Asian themed symbols you will find like a Bonsai tree, Koi, Chinese Lion statues and of course our big cuddly friend the Panda. This pokie features a 5×3 reel design but surprisingly there is 25 paylines, which helps raise this game’s payout odds. Usually a pokie with a 5×3 layout will only have 20 paylines. This is what gives this pokie its above average 96.17% RTP. The bonus feature here is trigged by the Yin Yang bonus symbols. Three is all you need to win 8 free spins and a 2x your wager prize, but if you are lucky enough to get 5 icons to appear on the reels you can look forward to 15 free spins and a 100x your wager jackpot. You must also keep an eye out for the Panda from the game’s title. He appears as a substitute symbol on the reels and he can take on the value of any standard symbol. He will only appear on reels 2, 3, 4 and 5. The most rewarding feature in this fun pokie however are the special Jackpots. There are 3 to unlock and they are all triggered by landing 5 matching symbols on the reels. They start off with the Minor jackpot which pays out 25x your staked wager and you can have a wild symbol act as a substitute for one of the symbols. The Major and Grand jackpots however require all standard or all picture symbols to trigger but they can pay between 200x and 800x your staked wager respectively. This is a really unique slot experience from Pragmatic Play, if the eye catching graphics don’t do it for you the 3 major jackpots certainly should draw your attention. This is another successful game from this trusted developer.